Preheat oven 350. Cut chicken into 1 inch cubes. Pour the starch over the chicken and toss til coated, I’m not pretty about it. Then I Distribute eggs over battered chicken. I find this easier than dipping them into the egg and losing most batter on my fingers. Heat oil in large skillet. Cook chicken until browned on each side. Place in baking dish. Mix ingredients of sauce. Whisk until smooth (I make earlier, let flavors combine some.). Pour evenly over chicken. Bake at 350 for 15 minutes. Turn chicken, bake for 15 more minutes. Also check out our others: BBQ Chicks, Buffalo Chicks, Lemony Snickets Chicks MORE CHICKS TO COME!!! Check back!!! 4 cups Rice, already prepared and cooked. Instead of water, use chicken broth to cook rice with! Broth cubes works. ½lb. boneless, no skin Chicken Breasts, cooked. Or shrimp, cooked. Or both. I just boil chicken. Or cook shrimp in pan. Or leave out as we did in photo. Heat sesame oil on medium heat. Add onion, garlic, peas, carrots. Stir fry until tender. Scramble eggs, mixing throughout vegetables. 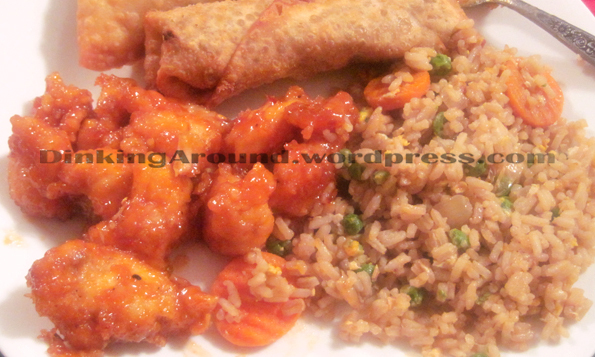 Add rice, chicken/shrimp, and soy sauce to pan. Stir in soy sauce and remove from heat. Drizzle 1/8 tsp Sesame oil over (Optional). This entry was posted in Appetizers, Main Dish O' Food, Marinades, Sauces, & Spices, Recipes and tagged appetizer, chicken, dish, game day recipe, side, sour, sweet. Bookmark the permalink.